Here are some more pics of beautiful scenery we saw along the way. Montana was pretty flat for some of the distance across, but then the mountains began. They were absolutely awesome! It was so cool to see the snow capped mountains when we were in 60 degree weather as we drove across the state. The mountains looked so close, but were many, many miles away. We stopped at the quilt shop Fiberworks in Billings, MT. This quilt shop is owned by Laura Heine who designs fabric for RJR Fabrics. She also designs her own patterns. The day we stopped she was doing a demo on her new pattern for tablerunners and placemats using raw edge applique. Lucky me! 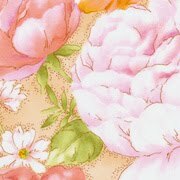 She designs and uses a lot of florals. I had to have a piece of her fabric. The design is large scale, which I normally do not use, but I could not resist the beautiful flowers and colors. The next shop that we stopped at was the Parkland Parish Quilt Shop in Tacoma, WA. A very cool shop. It was neat to just look at the building, besides the fabric! The building was over a century old! Very cute with selections mixed with antiques. We then headed to Seattle! While we were there we rode the DUCK! Such fun! We got to see some of the city by land and by sea! One of the highlights in Seattle was visiting Pike Place Market. This is a huge marketplace with every kind of food imaginable. There were so many people there and so many things to see! I loved the flower stands and they even had a quilt shop there called Undercover Quilts! I hope you enjoyed seeing some of the highlights from my trip! It was just awesome! The end of April, hubby and I went on a trip to Seattle. We drove out and took a train back to PA. It was the most awesome trip. The scenery was absolutely beautiful! It is so interesting to see how each state has it's own characteristics and beauty. Of course, we got to stop at some quilt shops on the way out too! Great fun! 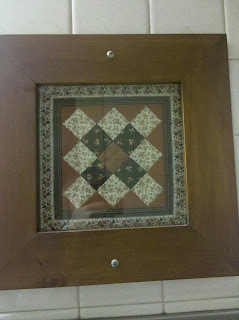 I would like to share some pics with you of some of the beauty that we saw and also some quilt shops and fun purchases. This is Abigayle's Quiltery in Olmsted Falls, OH. It was a wonderful quilt shop. The house was full of fabrics and they also carried Pfaff sewing machines which are my favorite machine. It was located in a village with other shops and was a great place to relax, shop and eat ice cream! We saw this sign in a town in Ohio or maybe it was Indiana, which unfortunately, I forget what town, but I thought it was a great sign. My hubby went around the block and parked, so that I could get a picture of it. Isn't he great! Next we stopped at the Quilt Foundry in Maumee OH. A very cute shop with a variety of fabrics. I had stopped there many years before and looked forward to seeing it again. 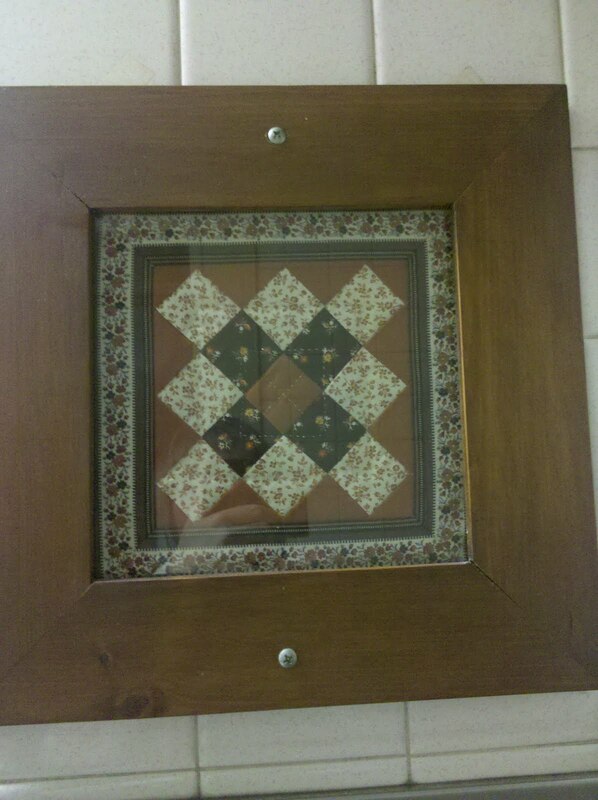 This framed quilt was actually in a gas station's bathroom. You never know where you will find quilts! We stopped at the Old Bag Factory in Goshen, IN. In that area was a shop called Quilt Designs. Quilt Designs specializes in selling original designed quilts. The designer is Kris A. Shenk. 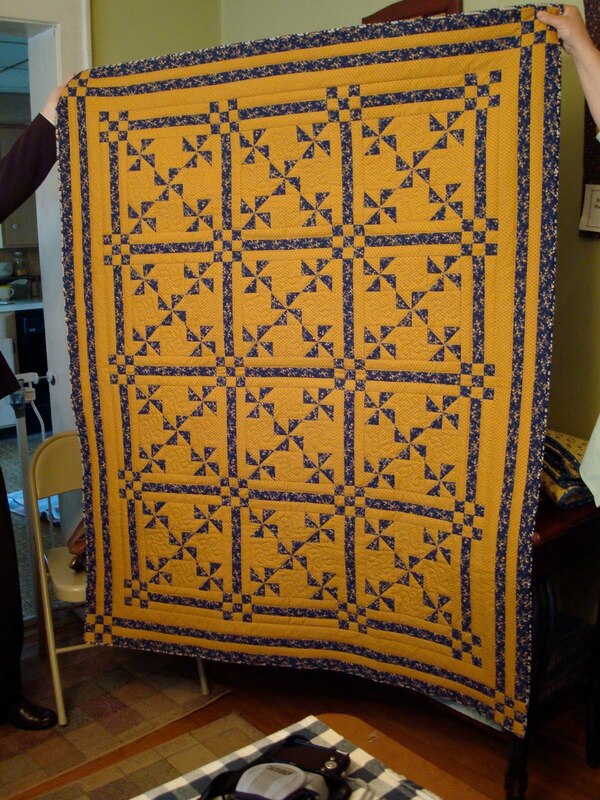 She does many beautiful quilts. While we were there I fell in love with a beautiful wall hanging. Never in my wildest dreams did I expect to get it. As we were getting ready to leave, hubby asked if I would like it. I couldn't say no! So he bought it for us. Isn't he great! He does spoil me! As hubby was buying it, I happened to think that the day before was our 37th wedding anniversary, so we decided that it would be our gift to ourselves. In the factory was also a pottery shop. 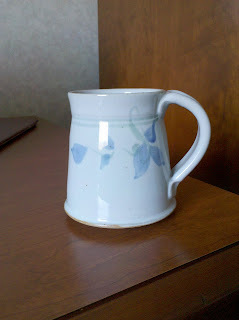 I also love pottery, so I needed a piece of that. I bought I mug, which I just love. I use it all the time. We took a little time to look around in Milwaukee, WI. This sculpture brought so much emotion to us. It was of children pledging allegiance to the flag. If you click to make it larger, you can see more of the expression on their faces. Beautiful! This was the Milwaukee Art Museum. It was fabulous! This is the outside of it and the thing that looks like sails or a fin, is on the roof of the museum. At certain times of day, it actually folds down and goes flush with the ceiling. Amazing! This was the inside. Awesome! 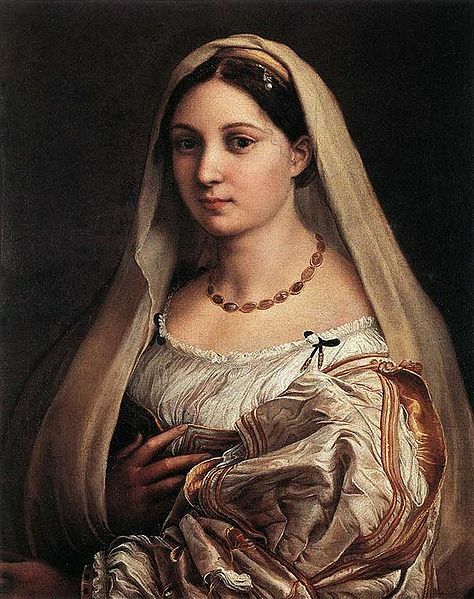 There were so many wonderful things to view in the museum, but my favorite was a special exhibit of a painting called The woman with the Veil by Raphael. It was absolutely breathtaking! You could get within 2 feet of it and really study it. It brought tears to your eyes. You just expected her to start talking to you, it was that real. You could even see a tendril of her hair hanging into her forehead. I loved the drape of the fabric, just everything about it. If you ever get a chance to go see it, please do. It is awesome! 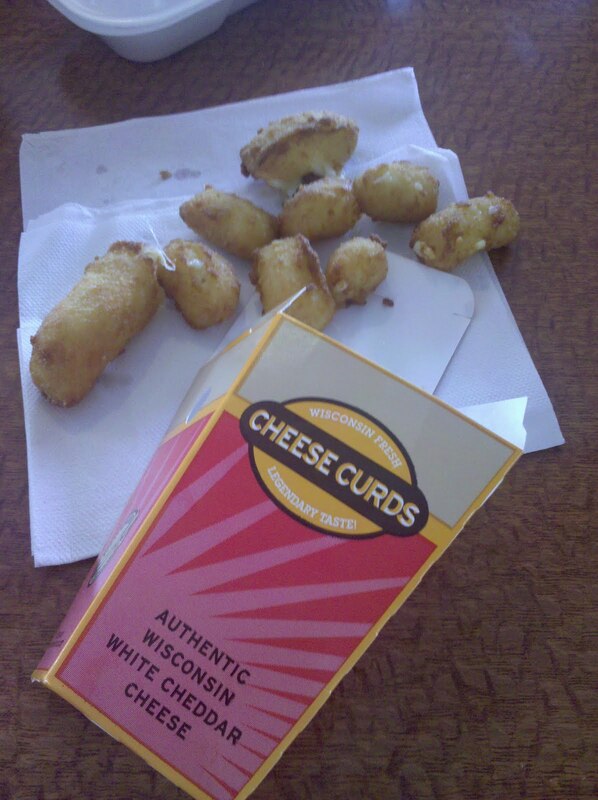 Of course, while we were in WI we had to try the Wisconsin Cheese Curds. Absolutely delicious! I highly recommend them. They are available at A & W's here in PA too. I could not resist this pattern called Flower Girls. Who knows when I will get it made, but I had to have it. This is a close up of one of the girls. Each one is different. This was a pic of the Badlands in ND. What a beautiful site. Well, that is all for today. I will continue our trip in the next post. I thought I'd better get a move on and try to get a little caught up on happenings the last couple of months. Towards the end of April my hubby and I took a trip out to Seattle, WA. It was the most awesome trip! I will post more about that in my next post. I wanted to share pics of April's club Show & Tell. My DIL, Zlaty ran the club for me while I was gone and took these pictures for me. Thanks so much, Zlaty! Stacey made a quilt for Quilts for kids. 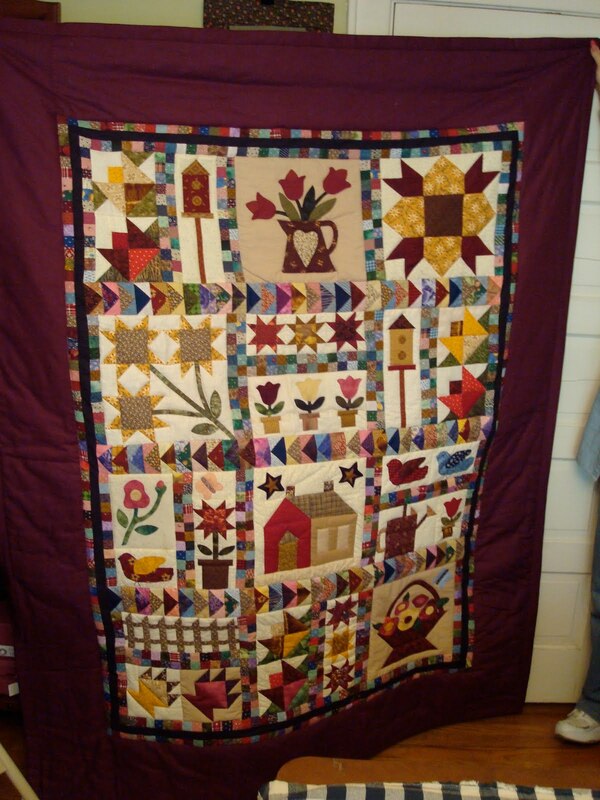 You can find out more info about these quilts here. Mary Alice was busy making her guild name tag. Great job! 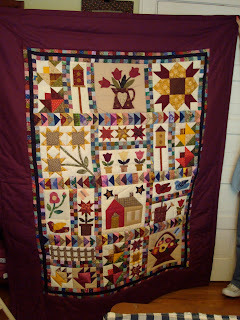 Judy finished her Cottage Garden Quilt from last year's club. Beautiful! 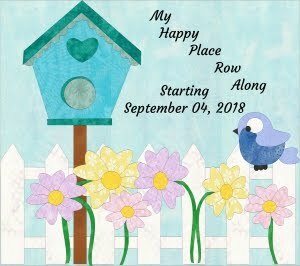 These are step by step photos taken by Zlaty and made by Pat to show us how to use Fun & Done patterns and the Batting Buddy Template. First step - Cut the backing using the Batting Buddy Template Frame. Cut the batting using the Batting Buddy center square. Sew strips diagonally across the block in a flip & sew manor. Fold in seam allowances and stitch. 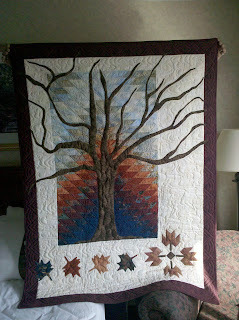 What a fun way to make a quilt and it is quilted as you go! If anyone is interested in the Fun & Done Patterns and the Batting Buddy templates, I just got some in. There are many wonderful patterns that you can use with the Batting Buddy. 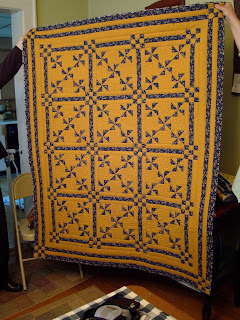 Here are some more wonderful quilts shared by Pat. 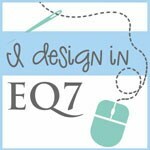 Thank you to all that shared their projects. I love them!